As soon as the guns fall silent in Syria, the people will begin to rebuild their country and their lives – this is the strong conviction of Tareq Emtairah, a reader at the International Institute for Industrial Environmental Economics (IIIEE). For that reason, he and his colleagues are starting visionary workshops in which exiled researchers and Lund University researchers will sketch out an outline for a sustainable future. Tareq Emtairah sees a lot of expertise and opportunities for interaction in diverse areas of research. The University, IIEE and the Centre for Middle Eastern Studies presented the idea to interested departments at a workshop in February. The vision workshops are intended to attract refugees from all over Sweden, particularly researchers from Syria. However, the concept has a broader scope. The crucial aspect now is to mobilise the University and make things happen. 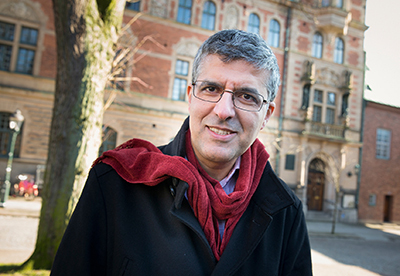 Tareq Emtairah sees a lot of expertise and opportunities for interaction in diverse areas of research such as technology, architecture, sociology, political science, and peace and conflict studies. He is also seeking confirmation from the University management that could give researchers the resources to finance the required period of work. It is hoped that the visionary workshops can also find answers to questions such as what type of tools the researchers need, and how knowledge could be conveyed to leading players in the conflict zones.